Last week I had an email from Nick, Nick is from Indonesia and is an expert balloon modeller, he does some wonderful creations, his sunflowers are awesome and so are his endangered species balloons, the most amazing thing about Nick is the fact that he is 10, wow I wish I had his talent when I was 10. You can check Nick and his balloons out at his website - http://www.nicorner.com. I asked Nick if I could replicate some of his balloons and he was kind enough to say yes, so here is the first, a Sea Lion. 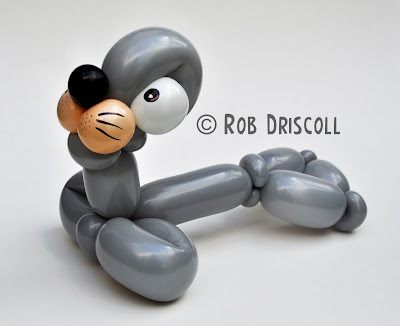 This sea lion is made from 4 balloons, I used 1 grey 260 balloons for the body and head, the rest of the balloons I managed to use scraps of white, beige and black 260s. Thanks Nick.